The Sexual Assault and Crime Victims Assistance Program (SACVAP), a member of St. Peter’s Health Partners, is launching a new initiative to help prevent and respond to interpersonal violence in Troy and across the Capital Region. 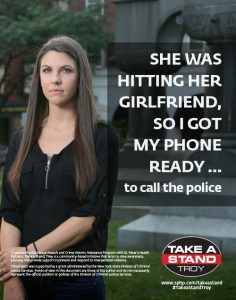 Centered around seven posters featuring well-known members of the Troy community, in combination with training for employees of local businesses, the “Take a Stand, Troy” initiative aims to raise public awareness about the power of bystanders to create a culture in which interpersonal violence is not tolerated. The posters, unveiled today at The Broken Mold Studio in Troy, will be hung at businesses that choose to join the initiative and which have completed training sessions provided, for free, by SACVAP. 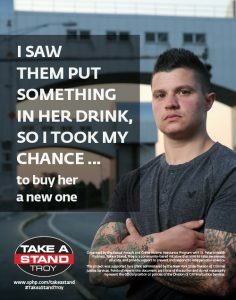 SACVAP is encouraging any and all local business to join the “Take a Stand, Troy” initiative. In the free training offered to local businesses by SACVAP, employees will gain the knowledge and tools necessary to identify and respond to situations where the well-being of a patron may be in question. Participating businesses will receive posters, drink coasters, informational materials, and other materials related to the initiative. Businesses interested in learning more or scheduling a training session should contact Sandy Stopera at Sandra.stopera@sphp.com or 518-271-3006. 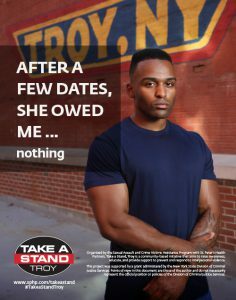 The “Take a Stand, Troy” initiative is supported by a grant administered by the New York State Division of Criminal Justice Services. 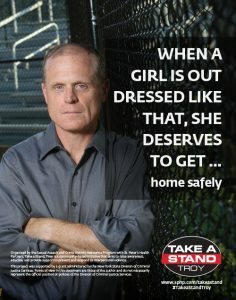 The Sexual Assault and Crime Victims Assistance Program, a member of St. Peter’s Health Partners, is the only agency in Rensselaer County to provide specialized services, including education, prevention and crisis care 24 hours a day, seven days a week to sexual assault survivors and crime victims, and their families and friends. All services are free and confidential. The program also offers a 24-hour hotline for individuals in need, 518-271-3257. The program is located on the campus of Samaritan Hospital, an affiliate of St. Peter’s Health Partners.